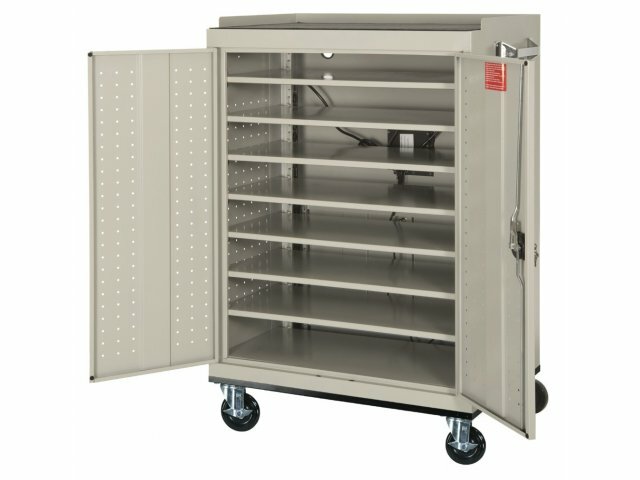 Laptop storage and charging carts keep your laptops safe, secure and ready to use. 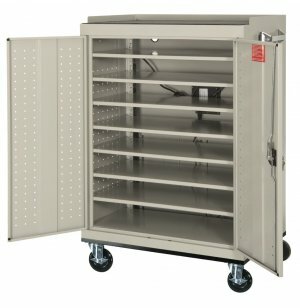 This Laptop Storage Cart from Sandusky makes it easy to store, transport and charge laptop computers, all in the same cart. Made of welded steel construction, this laptop cart is highly durable and built for everyday use. The doors open to a full 180° for easy access, with ventilation cutouts on the sides and wire-management cutouts in the interior. The 36"-wide shelves have a storage capacity for up to 16 laptops. What's unique about this laptop storage cart is its innovative timer device. This electronic timer clock lets you charge your laptops in stages without the time-consuming process of plugging and unplugging individual machines. For buildings with limited-capability circuitry, this is a major convenience. 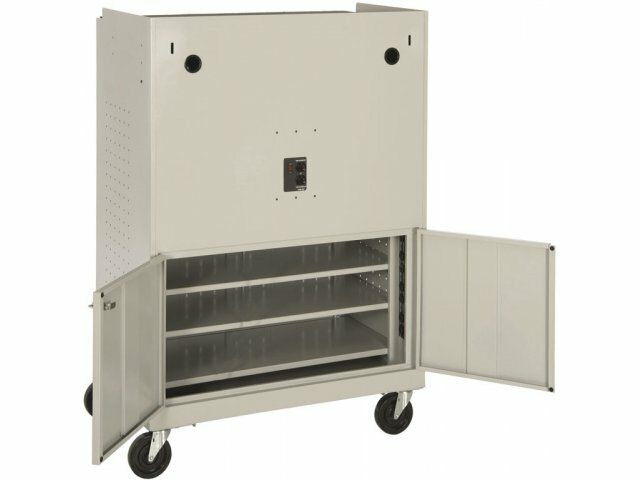 Available in a wide selection of colors to match any décor, this laptop storage and charging cart is a real asset to any school or office computer room. 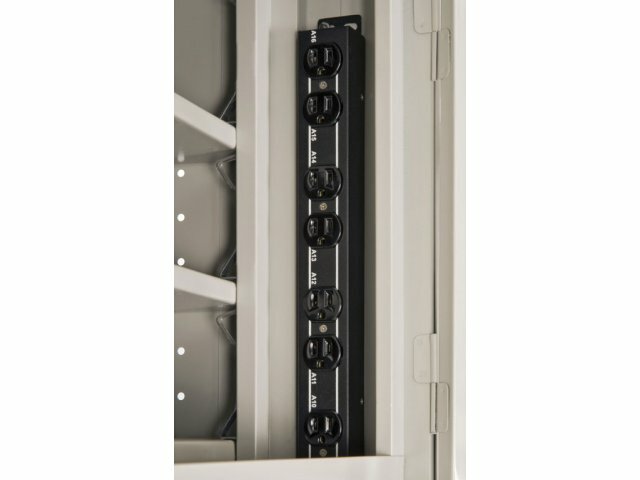 Multi-Charging: Two power strips allow you to charge up to 16 laptops at a time, thanks to the innovative electronic switch technology that turns the strips on and off in 15 minute cycles. 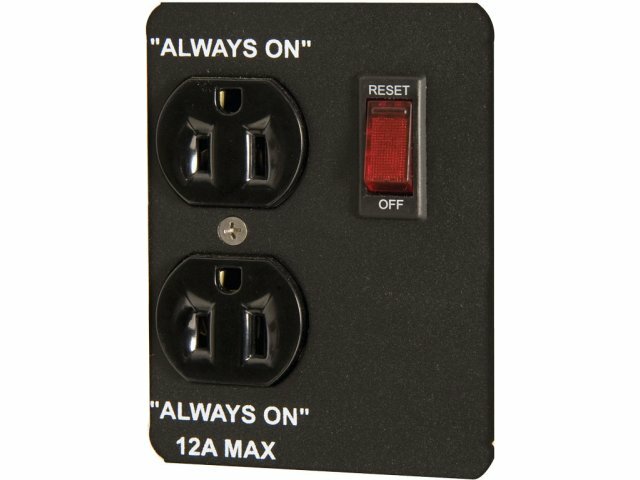 Features two convenient, "always-on" outlets on the back of the unit. Convenient Reset: Reset switch is located on the back of the unit.